Valentino's is the most popular disco club in Fiesta Land. They play hip-hop, techno and Spanish music. The 1st floor is mostly for dancing, and you can enjoy a drink while watching people dance from the 2nd floor. 9pm.-4am. Av. Camaron Sabalo, Fiesta Land. Mangos is located beach side across from the Seashell City Museum, Enjoy dancing to the sounds of latino and 70's - 80's music or make a special request from the D.J. any time. Things begin to pick up and the party starts after 11 pm every night. A fun and friendly place open weekdays 11 a.m. - 1 a.m. and on weekends 11 am - 4 a.m. This is the most popular outside beach club. The party really starts happening on weekends after 11pm and it is THE place everyone comes to after 2 am when the other bars begin to close. They play hip-hop, techno, rock, pop, 70's & 80's music. Open every night and has a foam party on Tue. & Sun. with a live band on the weekends. Drink in a great ocean view and dance! 9pm.-4am. 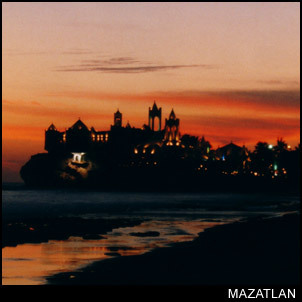 Coliseo's Disco, located south of "Valintinos", is one of the biggest nightclubs in Mazatlan. Coliseo's is easy to spot because it's shaped round, like a Coliseum. The main room is filled with great lighting effects and the sounds of latino, rock, hip-hop or techno mucic (live band on weekends). Open from 9 pm to 4 am. This is a Karaoke Bar located next to Valentino's disco club. There is a stage in front, and you can request the song you want to sing. 9pm.-4am..
Bali Hai is a sports bar that plays hip-hop, techno, pop and rock music. Located in Fiesta Land, next to Bora Bora. 9pm.-2am. Located across the street from the Gaviotas movie theater. They play Mexican, salsa, hip-hop and rock music. You can eat and get ready for the party in a separate section of Mundo Banana Restaurant. Great food, great fun! Open on Wed.-Sun. 8pm.-3am.